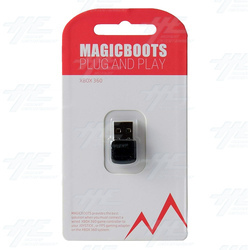 The MagicBoots FPS Adapter Joystick Converter for XBOX 360 provides the ability for your Joystick or FPS gaming adapter to be connected to your XBOX 360. By plugging in the MagicBoots USB, the LED inside the USB will be lit stay lit once the Joystick or FPS gaming adapter has been identified. The MagicBoots FPS Adapter Joystick Converter for XBOX 360 is the perfect tool to allow you to use your favourite controllers on your XBOX 360. The MagicBoots FPS Adapter Joystick Converter for XBOX 360 is the perfect tool to allow you to use your favourite controllers on your XBOX 360.